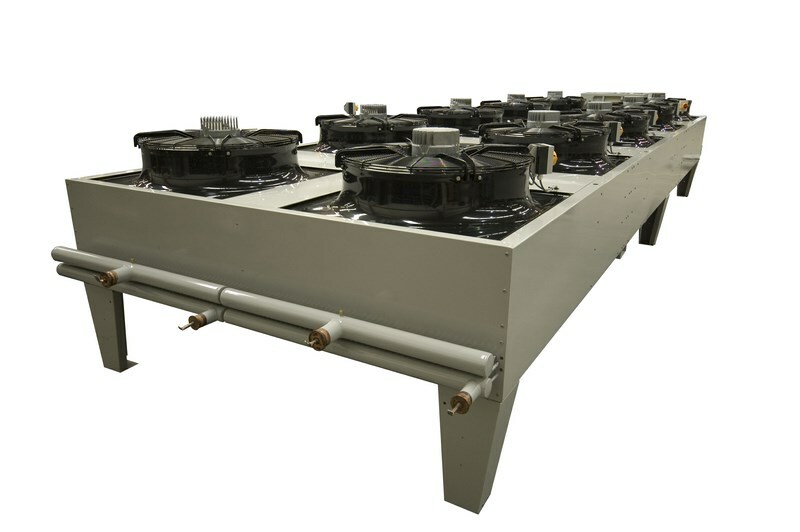 Our standard AF range of Dry Coolers are air-cooled liquid heat exchangers manufactured from copper tubes with extended aluminium finned heat transfer surfaces. They are supplied as a complete fan, heat exchanger assembly with vertical air flow and do not include coolant pumping circuits. 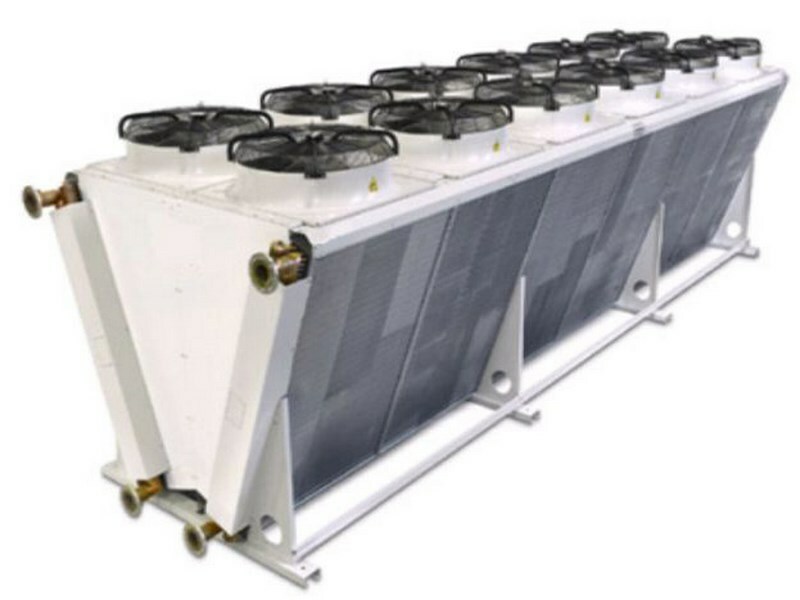 Our Dry Coolers can also be supplied with horizontal air flows, V bed configurations, stainless steel tubes and various fin finishes and materials. The AF range of Dry Coolers have many advantages over mains water or open tower cooling and provide an ideal method of maintaining suitable working temperatures in many process applications. They can be used to remove heat from processes where the required coolant temperature is approximately 10°C – 20°C higher than ambient. 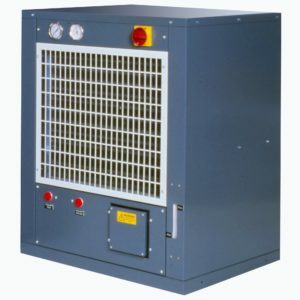 Typical industrial applications for our Dry Coolers include heat removal from induction equipment, welding plant, vacuum chambers and Dynamo-meters. 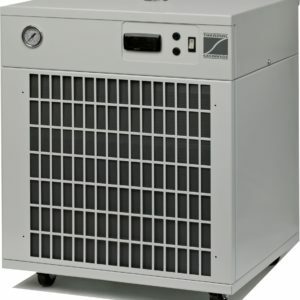 Other applications for our Dry Coolers include the indirect cooling of refrigeration and air conditioning circuits and supplementary free cooling. Connection Size 1 set(s) 1 1/4" 1 set(s) 2" 1 set(s) 2 1/2" 1 set(s) 2 1/2" 1 set(s) 3" 1 set(s) 4" 1 set(s) 4"
High efficiency, low noise, low power consumption, constructed from lightweight non-corrosive polypropylene. Complete with blade side guard. Manufactured using high efficiency double corrugated aluminum fin matrix with copper tubes. All circuitry is carefully selected to give optimum transfer capability. Optional fin materials are available to suit aggressive environments. 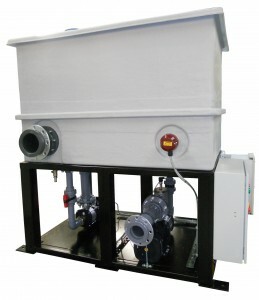 Self contained system complete with non-ferrous/ stainless steel pump, expansion tank and fused control circuit housed within powder coated weatherproof enclosure.